A young-ish, rural professional who spends most of her time chasing children and chickens…and tequila. 20% off your ENTIRE KITCHEN purchase-jackpot! Last Thursday I posted a quick and dirty post as we headed out the door to Ikea to plan the kitchen. We arrived to Ikea around 2:30 pm (it took a little longer because we had to make a Starbucks and potty stop along the turnpike). Seven hours later we walked out with a complete kitchen plan, a bathroom sink and a happy marriage. Mission complete! That is not to say there was not a little drama and problem-solving along the way. The first dilemma was that neither of us had thought about needing cash for the Turnpike tolls. The hubby (or should I call him “Ned Stark”) saved the day and remembered his secret stash of “gold dragons”. “Gold dragons?” you may ask…you have never paid for anything in dragons? All the cool kids are doing it (all of the cool, rich kids in the imaginary city of Westeros). The hubby is currently obsessed with Game of Thrones and has taken to carrying dollar coins that he refers to as “dragons”, the currency used in the book/TV series. He likes to leave them as tips when we go places; he thinks he is starting a trend. I think we are just asking to be pelted with the coins by a disgruntled waitress who does not want them weighing down her apron. Once we had arrived at Ikea we grabbed some swedish grub. Important note: after lunch and before dinner is not the best time to get Ikea food, even the meatballs were dry. While eating, we game-planned our afternoon, set up some rules and expectations, and printed out our Ikea Family Card. The Ikea Family Card has perks like discounts on monthly specials, free coffee and tea in the cafe, and an extra 30 minutes for kids in Smaland. The extra 30 minutes of child care is key; without it you only get one hour. You cannot even walk around the store in one hour. Once we had a game plan I went down and put the child into Smaland, and the hubby headed to the kitchen section to start planning (actually he headed out to the car first because I left our blueprints in the car, whoops). If you have never used the childcare at Ikea I totally recommend it; there are things for them to color, movies to watch and places to climb. Maggie loves it. Did I mention it is free? That is what makes it really awesome. You put their shoes in a bin and sign them in, then you get a matching bracelet so no one can kidnap your kiddo. Your child gets to burn off some energy and you get to have child-free time to spend argue with your significant other while perusing the store. The planning started out a little rough. They had a lot of employees staffing the kitchen area and not a lot of customers (not a lot meaning TWO customers counting us). Apparently they like to keep a lot of staff standing around; it took a while to get someone to actually help us. After some time spent being frustrated we were able to get a helper, Stephen, who disclosed that he was “new” and still figuring everything out. However, he ended up being a wonderful source of information, and I am pretty confident that by the end of our night Stephen could consider himself an “expert”. Eventually I just gave up my seat next to the hubby so Stephen could sit down. At this point in the process I realized that I had left my wallet and phone over at the kitchen display (this was right around the time I was pondering why they do not sell wine at Ikea). Luckily someone had turned it into Lost & Found. Collecting it involved about a mile long walk to retrieve it, but I was relieved to get both items back intact. I then headed to Smaland to pick up the kid. We were unable to get the kitchen planned in the allotted time for Smaland, but there were kids for her to play with in the kitchen section by the time we got back, so that was a good diversion. We wrapped up our plans, and were given a purchase list right around 8:30 PM. Our total cost, including appliances is right around 15,000 dragons (can you imagine paying that in dollar coins?). We will save 20% off of the total so that will bring us down to $12,000. That includes a refrigerator large enough for a polar bear to live in it, a microwave, a dishwasher, a professional-sized range AND a wall oven. 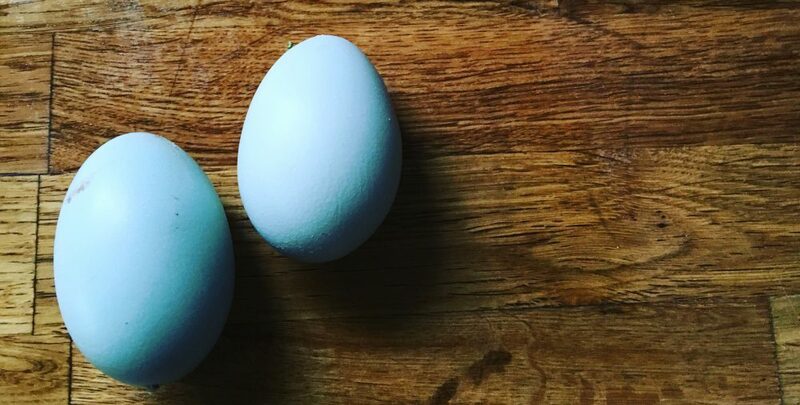 Imagine the Christmas cookie possibilities. We did not order Thursday night because we still had to pick out the inserts for drawers and cabinets (utensil organizers, pots & pans organizers, etc). This would have involved a lot of brain power along with conversation, and at that point in the evening we did not have it in us (I know, first-world problems). Plus, we still needed to snag our bathroom sink before closing (we are also in the process of planning a bathroom on the second floor-there will be a post later this week). Looks like we are headed back down in a couple weeks. So what do you think? We are going with white cabinets and butcher block counter tops. These images have no counter tops in the design because we have to order them locally. I realized after looking at my Pinterest Kitchen Ideas board that I am obsessed with light, white, airy cabinets and dark floors and counters. The hubby said we cannot stain the counters; so I am still trying to figure out other options to make them dark. We considered granite (really pricey) and concrete (really heavy). What do you have for your kitchen counters, or what would you want in your “dream kitchen”? Framed up and ready to go! The hubby and the contractors have been working steadily to get the house ready for the electricity to be run this weekend. We went up this past Sunday to check it out, and it is pretty amazing to see the layout. All the rooms have framed up, including closets and widened doorways. I got to help the hubby put dry wall blocks up, which involved the use of power tools. This was not nearly as much fun as I thought it would, but that could have a lot to do with the sweltering temperatures and the adult beverages I indulged in the night before. Next I will share the living room with you. I apologize that the pics do not match perfectly. As I was putting this post together I was cursing myself for not taking pics from the exact same spots for the before and after series. Rookie mistakes. 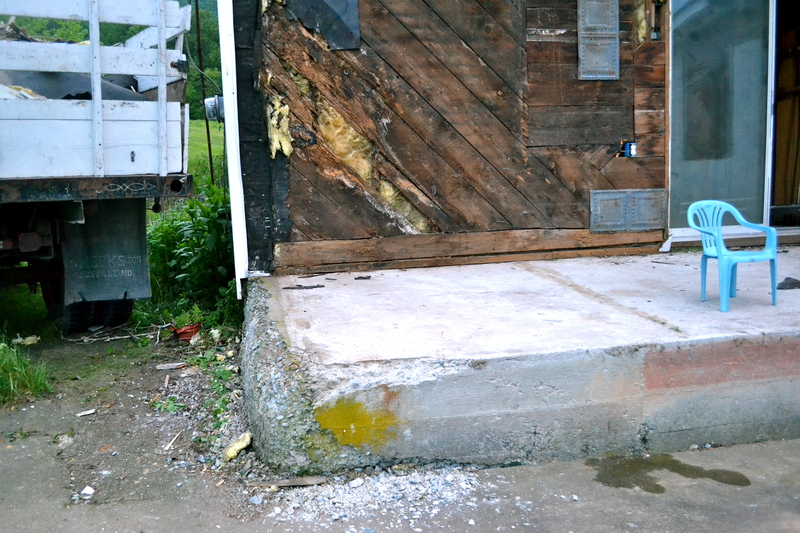 And here you can see what it looks like with the wall removed. We decided to open up the staircase leading to the attic in the office. The downside is there will be no way to close the attic off from the office, but we figured when it is eventually turned into a guest room the office door can always be closed. At this point the we are ready for the electrical work which will take place this weekend. My brother is going to come up for the weekend to do all of the wiring with the hubby’s assistance. (He is an electrician by trade.) The only thing we have left to do before the wiring can take place is to finish the kitchen plans. (Yes, I did post about finishing them a few weeks ago; we work to deadlines.) Before we left the house this weekend we did one final check on measurements so that the plans are precise. We are going to finalize the kitchen plans tonight (for real this time), and then are planning an Ikea trip tomorrow. Hopefully, it will not end in a divorce. We have been known to have a lively debate or two in the middle of the bathroom aisle. That being said, Ikea is one my favorite places to window shop. I love all the mini-rooms they have set up and the kid’s mac and cheese. The hubby loves the meatballs. Have you ever been to an Ikea? What was your favorite part? Today I am working on a post about the heating and cooling system we are installing at the Yrppie homestead, which involves some research and drafting so that the information is accurate and makes everyone want to invest in geothermal. In the meantime, I wanted to share one thing that we Yrppies like to do, and that is entertain and feed people. This past weekend we had some peeps over for crabs from Wegmans Crab Feast. (I am currently compiling a list of things I will miss about Harrisburg; Wegmans is in the top 5. I really like having the choice between 16 different types of cheddar cheese and 100’s of craft beers in the same place.) 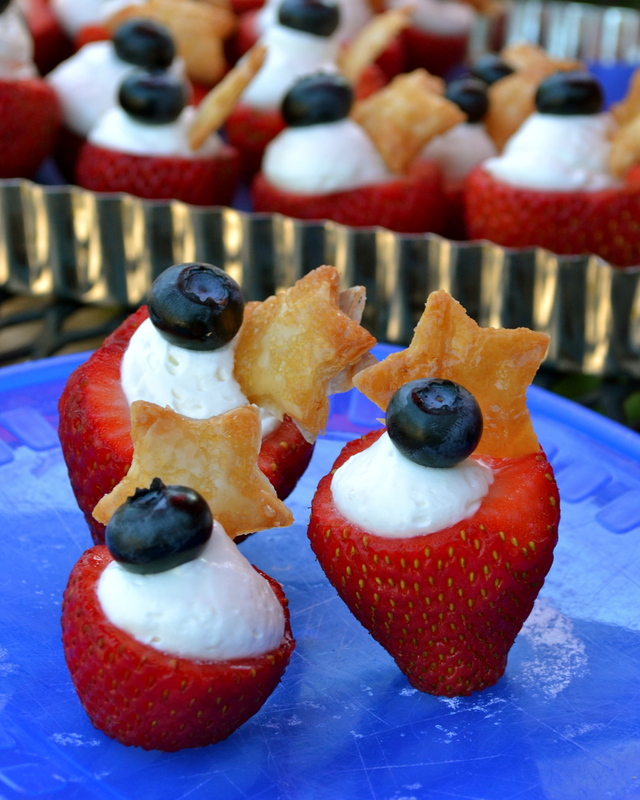 To satisfy the masses’ sweet tooth I made these OVEN-FREE cheese-cake stuffed strawberries. 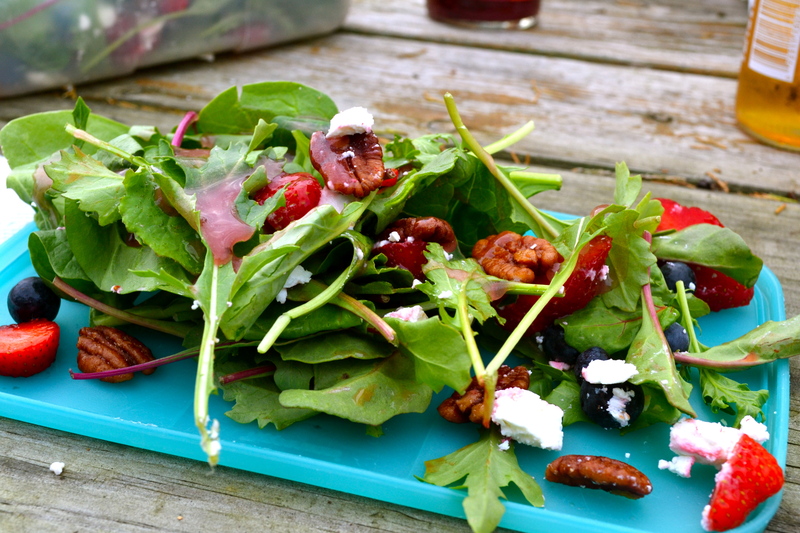 Simple, yummy and no electricity required. A perfect recipe for a Yrppie without a kitchen. Click here to see step-by-step directions for how to make these sweet treats! We are still in the process of battling Ikea’s virtual planner, so while you wait to see the grand unveiling of the 3-D kitchen plans I decided to share the progress we have made on the kitchen addition, fondly referred to as the “kitchen bump”. The kitchen is in the back of the house and faces the backyard; in the picture below you can see the “before”. The hubby and I were both in agreement that the kitchen needed to be enlarged from its original size. Our Harrisburg kitchen is small and does not have a lot of counter space. The appliances are all close together which makes for close quarters if you are trying to make dinner and load the dishwasher at the same time. The decision was made to remove the built-in porch (it was falling down anyway), and to “bump” out the kitchen to create a more permanent addition. 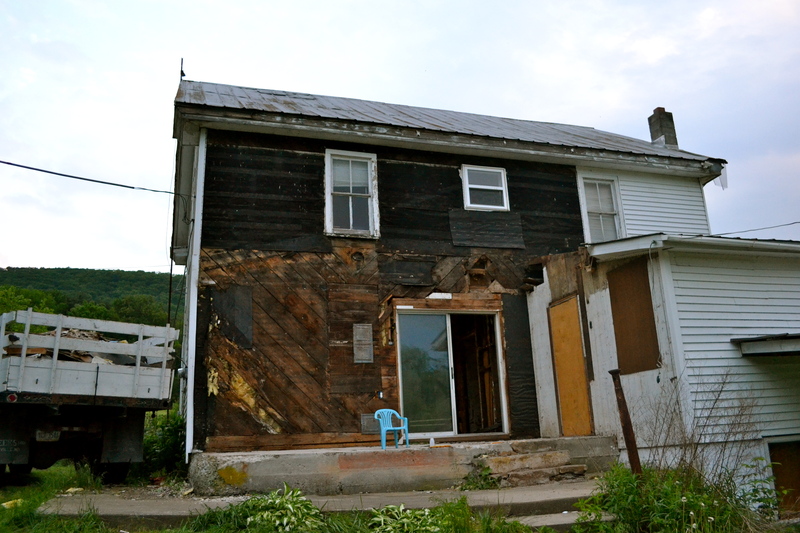 The first step was to tear down the porch; the contractors were ridiculously fast at this and it was really exciting to see it come to fruition so quickly. Finding termite damage was not so exciting, but the hubby did not seem too upset over the discovery. He gave some complicated explanation about the life cycle and leaving the wood to burrow in the yard during the summer, etcetera, etcetera. During his explanation, I realized I probably could have paid better attention in Dr. Yoho’s Entymology class back in undergrad because I still don’t understand why they would not return to munch on the new kitchen come the fall. The hubby assured me we could wait to treat the house after the renovations were complete and that the termites would not destroy the NEW kitchen. We shall see. Once the porch was off and the sliding glass doors were gone forever it looked totally different on the outside and the inside. A few days later “the bump” was complete and it looked awesome. The kiddo and I drove up the evening it was completed to see it and surprise the hubby with a picnic dinner. The first thing I checked out when we got out of the car was the roof color. I was thrilled to see that it was exactly the color we were imagining. We had chose “avocado green” without actually seeing it in person, so there was some worry that it would not be what we wanted. It was perfect though, and eventually the roof will be replaced on the rest of the house to match. Tonight the hubby and I are sitting down to layout and plan the kitchen. We have picked out an Ikea kitchen per my request. I am super excited about the white cabinets with lots of room for organizing and wine bottles; he is super excited about swedish meatballs and teeny-tiny allen wrenches. The planning and layout you do all on-line; it is in 3D and can be user friendly once you know what you are doing. Once the plans are done you save it in your Ikea account, head to the store, and share it with one of their “Kitchen Experts”. They look it over and either give you the thumbs up, which means they can then help you order all of the flat-packed materials you will need from their little kiosk, or they give you a thumbs down. Thumbs down means you then have head down to Smaland to see if you can extend your 4-year olds play time so that you and your significant other can have a quiet domestic dispute over the changes that need to be made in the presence of a “Kitchen Expert”. We are hoping to avoid being “that couple” in the kitchen section and perfect our plans tonight. I will let you know how we make out. We are becoming quite skilled in the art of compromise throughout this renovation process. Check out the pictures below to see our inspiration (these were taken on my phone in Ikea so the quality is pretty poor). What do you think a “dream kitchen” should have? Overwhelmed by what to write as a first post, I decided to start at the beginning (see title of post). We are currently at the electric/HVAC stage of our renovations, but it is important to understand where we began. 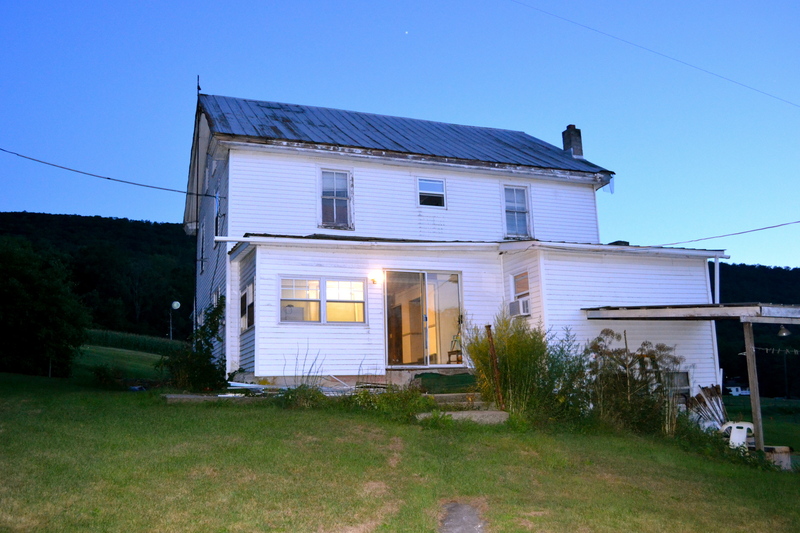 The house we are renovating is over 100 years-old, sits on a hilly 2 acre lot and is really, really close to the road. It is actually the house the hubby’s dad grew up in, and it has always been a dream of the hubby’s to inherit this property. It has not always been mine. To be completely honest if someone had asked me 5 years ago if we would ever consider moving “back” to his area my answer would have been in the form of a condescending laugh followed by a very confident “No.” (I think this may have even happened a few times.) A lot changes in 5 years though, and having a child gave me the chance to re-evaluate our goals and priorities. Moving to the middle of nowhere so our daughter could have space to play and grow now seems like a better fit. Slowly the hubby’s dream has become mine (with an updated kitchen and lots of room for entertaining and guests), and it is hard to believe that in a few months it will be a reality. My initial bargaining chip was that we should demolish the existing structure, and build a new house closer to the middle of the lot. I wanted the house further away from the road (and a great room with a cathedral ceiling). This was quickly shot down by the hubby with the argument that building new is not as sustainable as renovating. After some research he easily won the debate (this does not happen often; it was good for his ego). 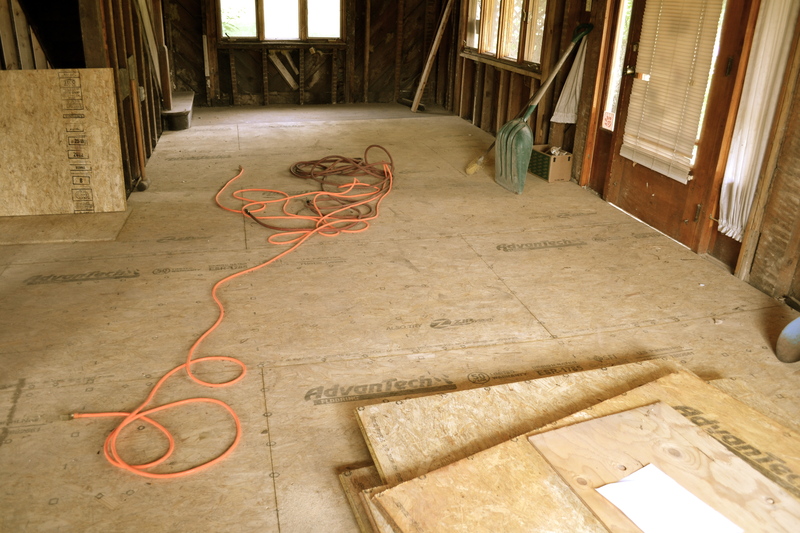 In a future post I will outline the pros and cons of building new versus renovating, but for now I want share with you the before pictures of the first floor before any work had begun, with the exception of the kitchen demolition. In the following pictures the hubby had already tore out the upper kitchen cabinets, some of the wall and the drop-ceiling. One really cool thing we found, that could not be salvaged, was an old, ornate tin-ceiling. The house is an odd mixture of original structure and later additions; there is a “shanty” built onto the back of the house on the right-side, and a covered porch on the left-side. 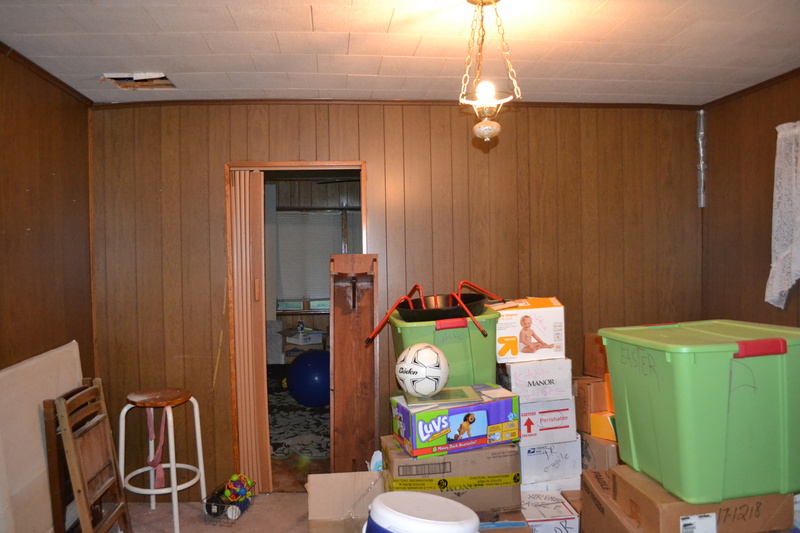 You will also notice that previous inhabitants were completely enamored with wooden paneling. We do not share this love. 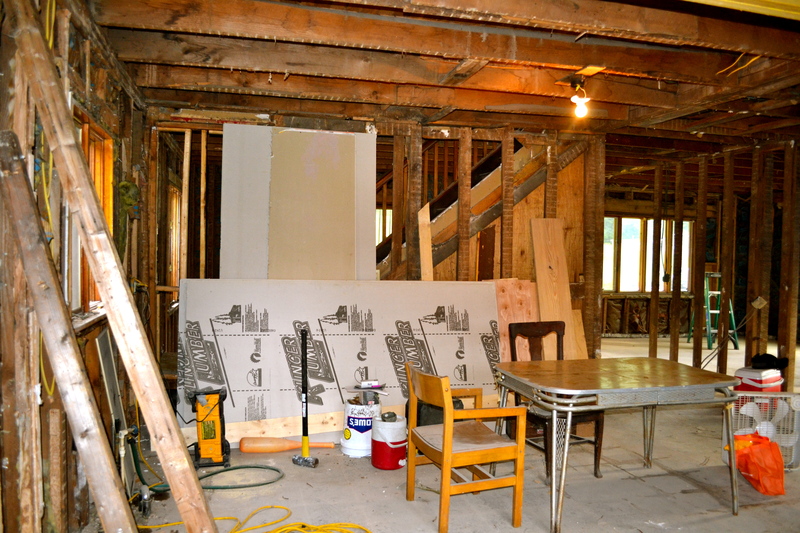 In my next post I will give you a tour of the before pictures of the second floor and attic. Wherein I try to be bubbly and cheerful (but sometimes fail)! Welcome to the Young and Domestic. Watch us renovate!